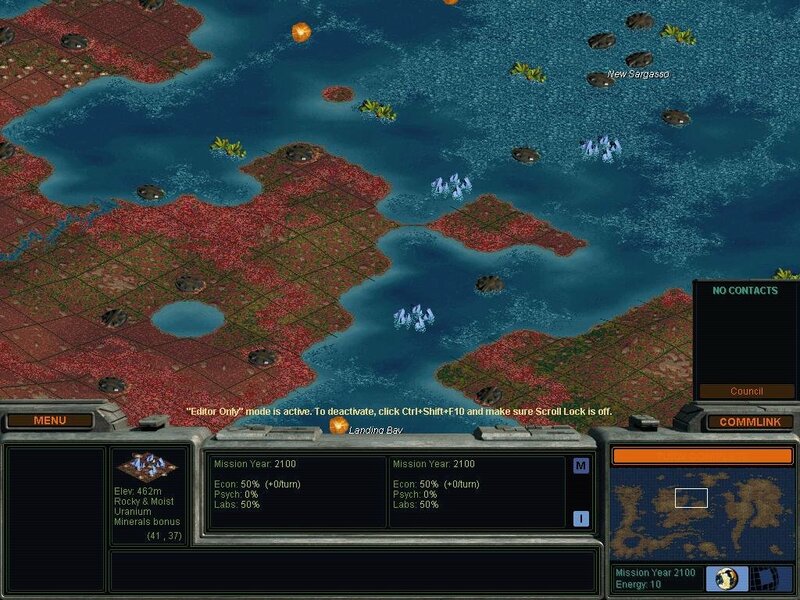 Sid Meier’s Civilization rockets into space. 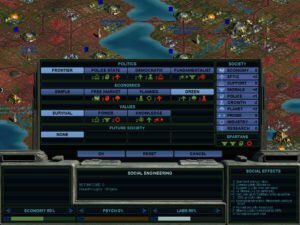 When Sid Meier and Brian Reynolds left MicroProse to form Firaxis Games, strategy fans were left wondering what would become of the Civilization series. 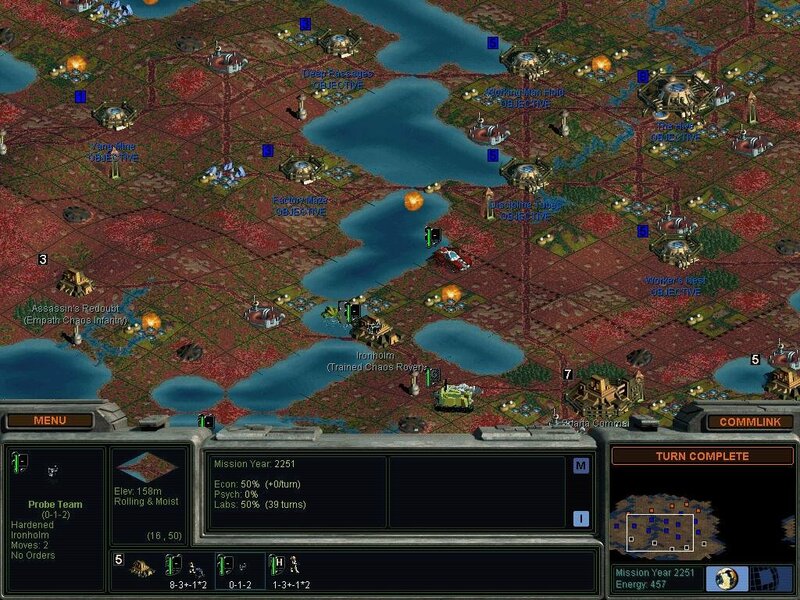 After all, Civilization II was pretty widely accepted as one of the best strategy games ever. 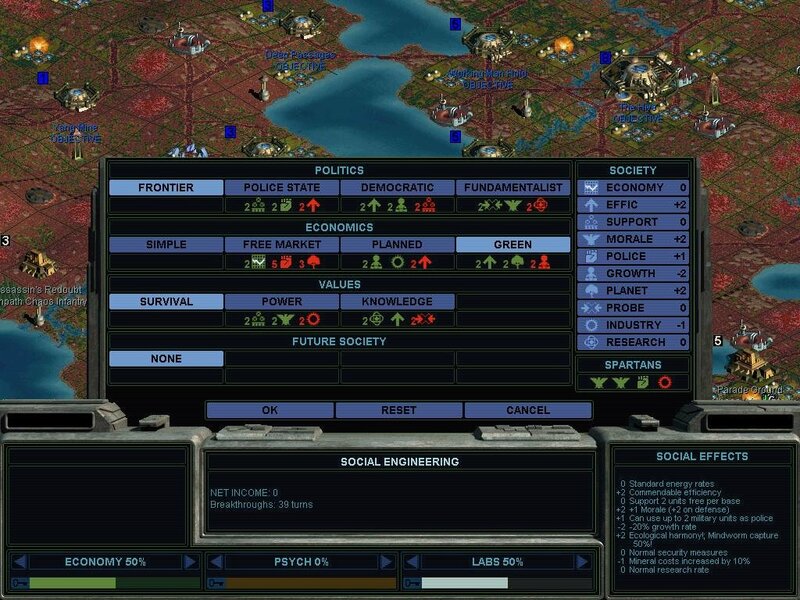 But they didn’t have to do a third game with the Civilization label on it, since they were already busy creating a game that would inherit the Civ throne. 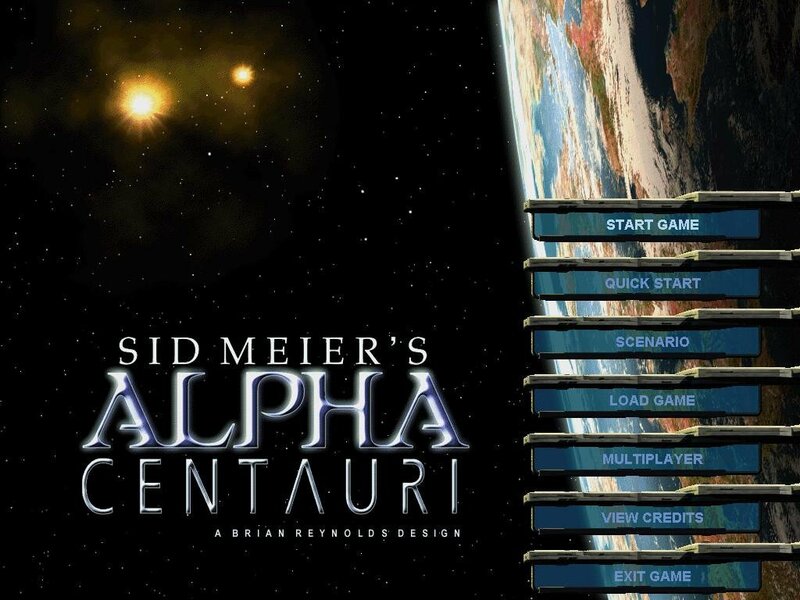 That game was Sid Meier’s Alpha Centauri. As you astronomy nerds might be aware, Alpha Centauri is the closest star system to our own, and luck has it that it’s also habitable. A ship gets sent there to colonize the place, but eventually the crew brake up into ideological factions. 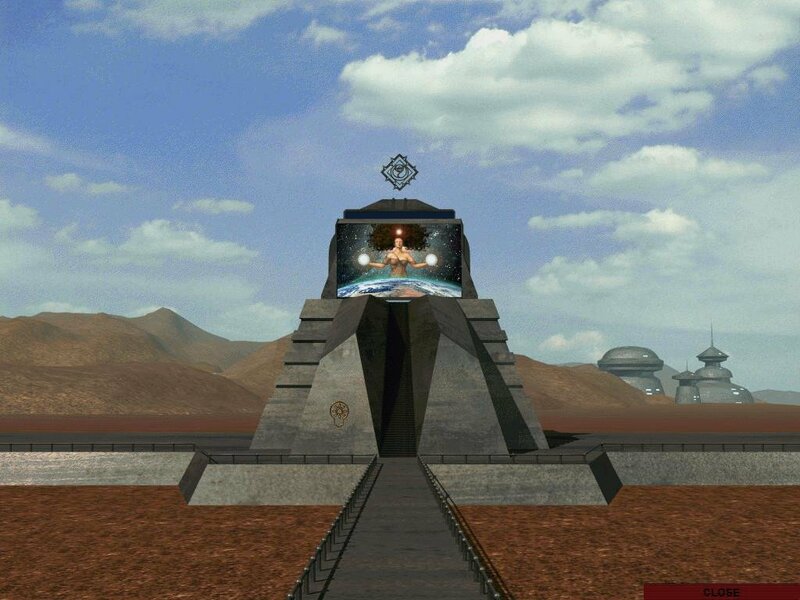 You assume control of one of the factions with the goal of becoming the dominant force on the planet. 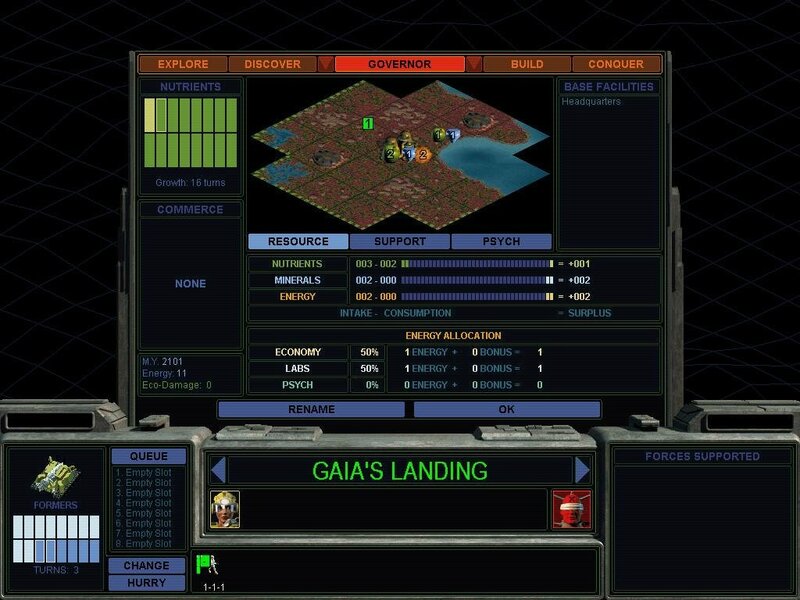 Meier and Reynolds perfected their model for turn-based strategy games a long time ago, and Alpha Centauri doesn’t deviate far from the formula. 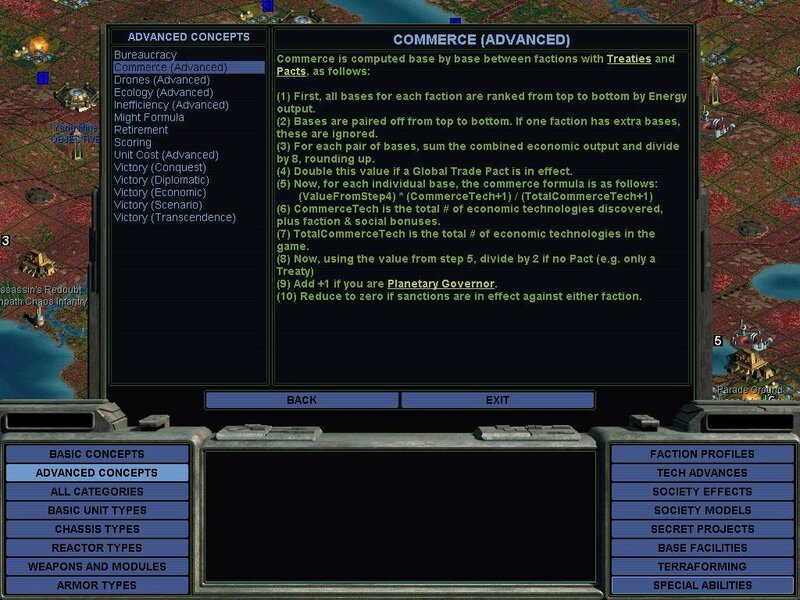 Essentially, you begin with a base and a small number of resources; from those humble beginnings you must develop technologies, expand your empire, and eventually conquer the world. 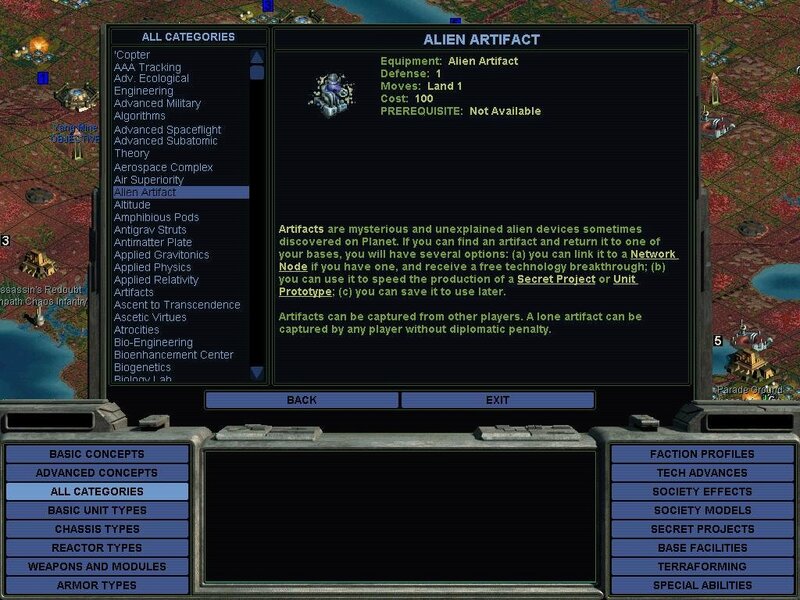 That’s not to say that Alpha Centauri merely Civ 2 dressed in sci-fi jargon. 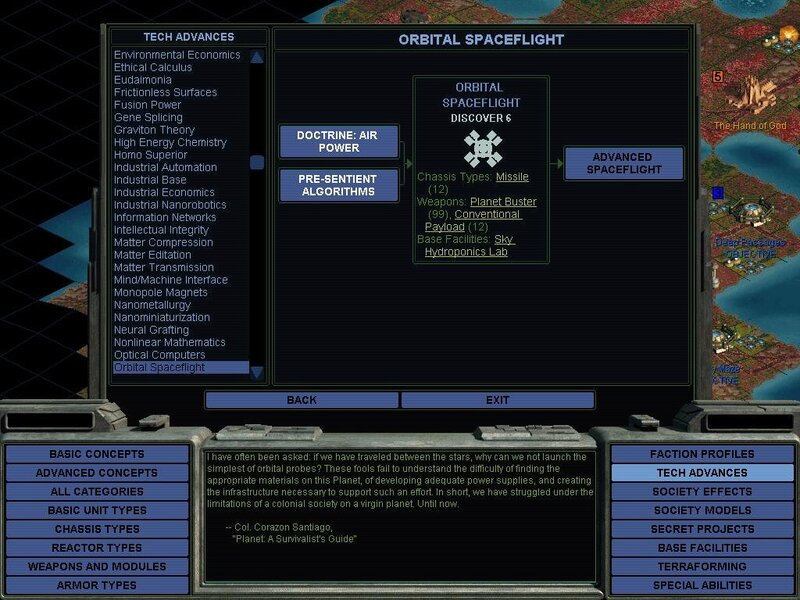 It’s much more advanced than that, but also fundamentally familiar to Civ fans. 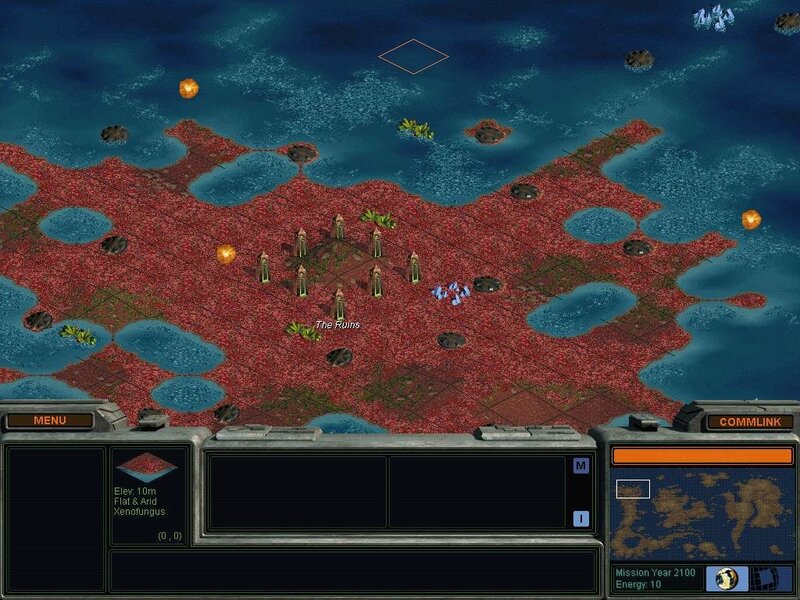 The interface will be familiar to anyone who’s played Civ 2, but it has been streamlined and is easier to navigate. 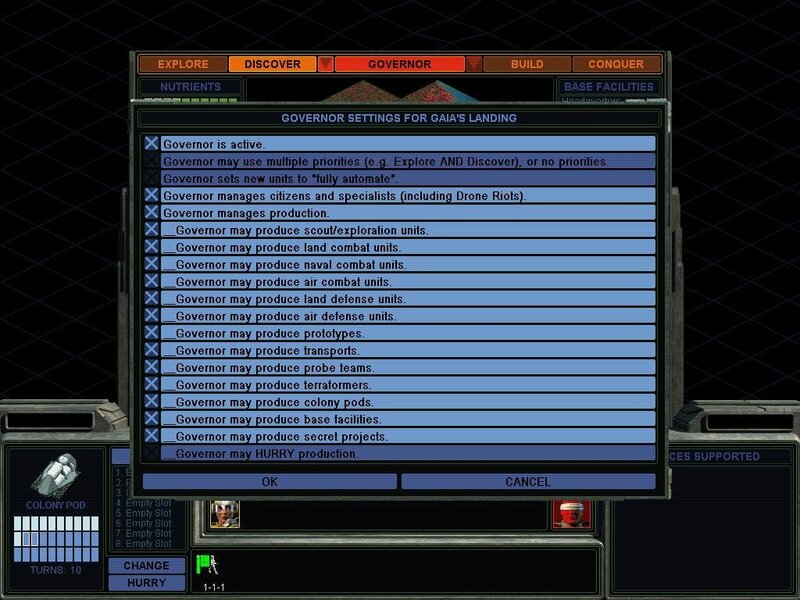 The building/research mode has been broken into four areas — explore, discover, build, and conquer — which helps you determine what each computer-controlled city governor will research and build. 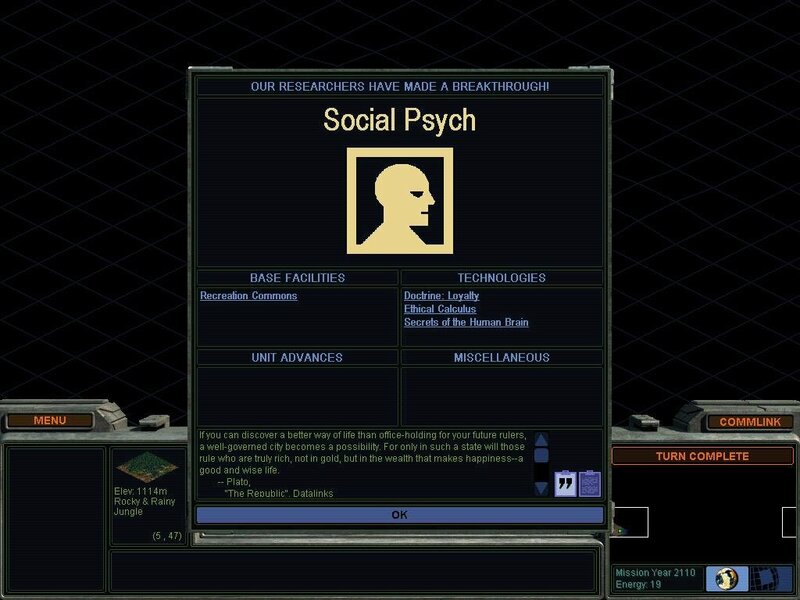 Other welcome additions include borders that define your territory (which prevents the roaming “musket men” that could be so annoying in Civ II), observation posts that let you track anyone in your territory, and a workshop that lets you design units. 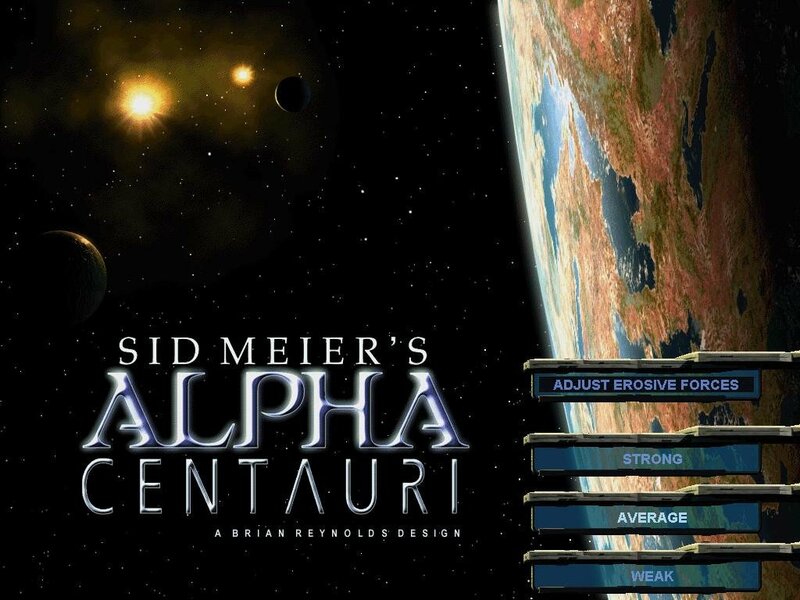 Those welcome additions aside, the real genius behind Alpha Centauri lies in its depth. 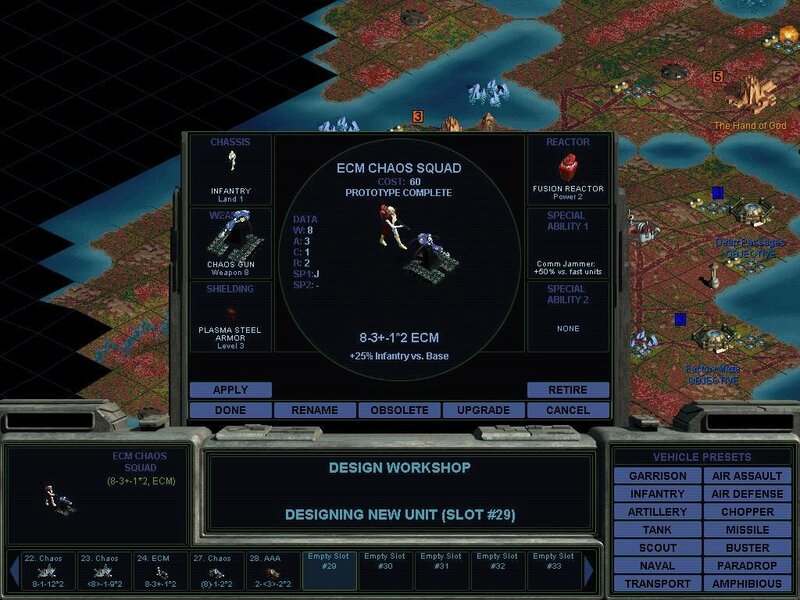 Multiple victory conditions cover the entire spectrum: You can achieve victory with military dominance, economic dominance, diplomatic means, cooperative victory, or victory through transcendence. 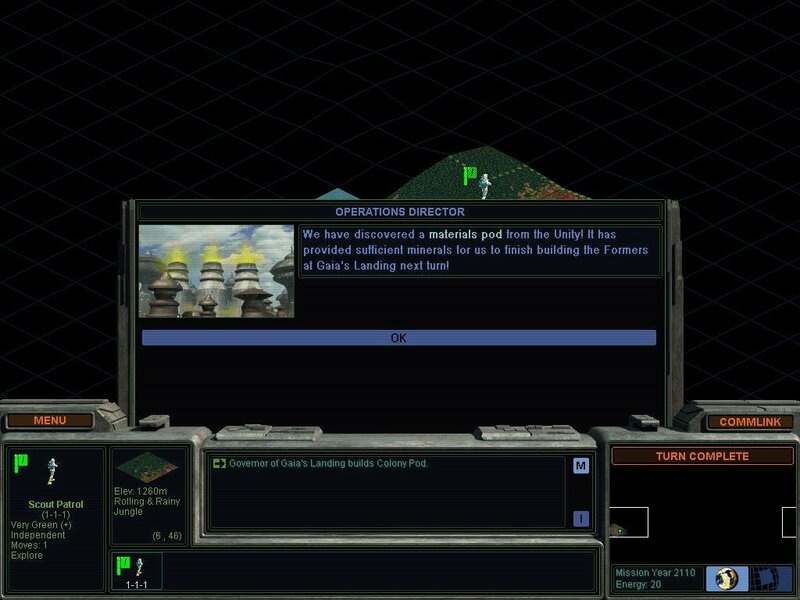 The diplomacy model has been improved, and the other factions respond more realistically; a threatening tone is not always met with a military attack, and you can bully certain factions into doing your dirty work. 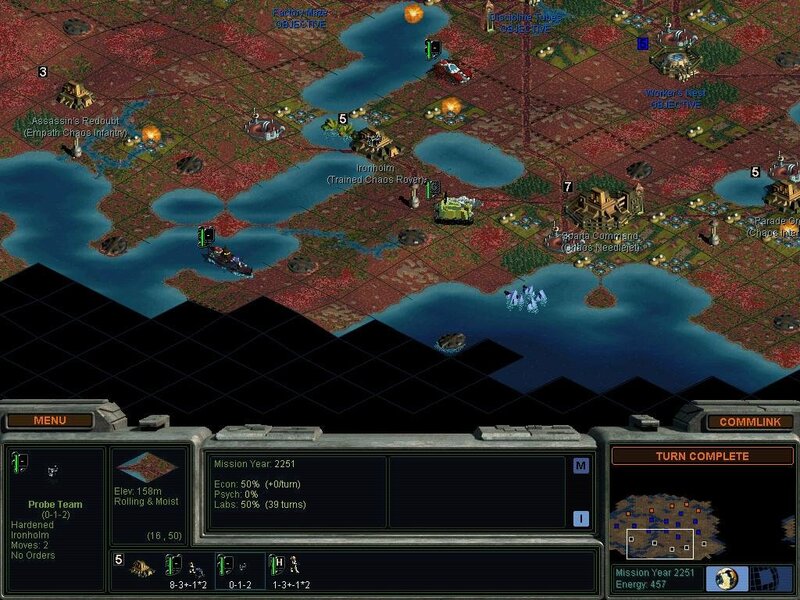 Unlike the first version of Civ 2, Alpha Centauri does include out-of-the-box multiplayer. 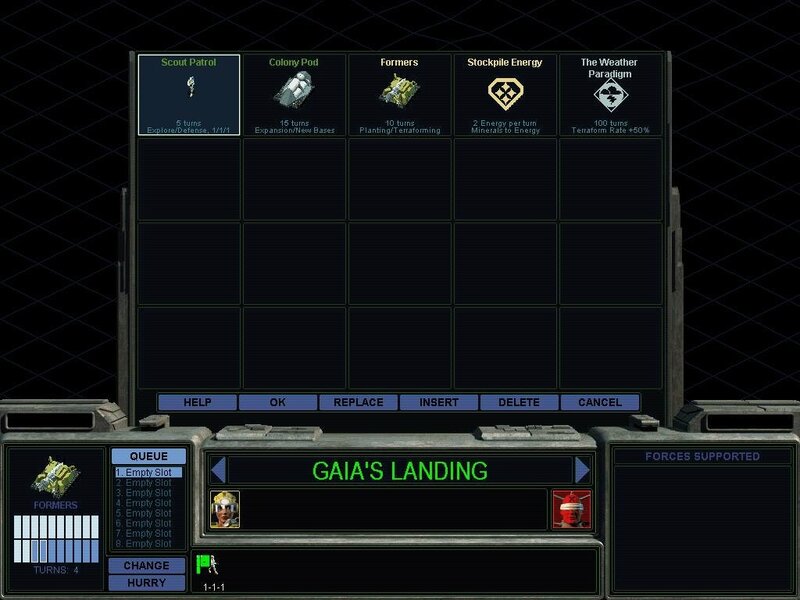 The interface is clean, with a straightforward chat feature and a detailed negotiation screen where you can exchange technologies and create treaties or pacts. 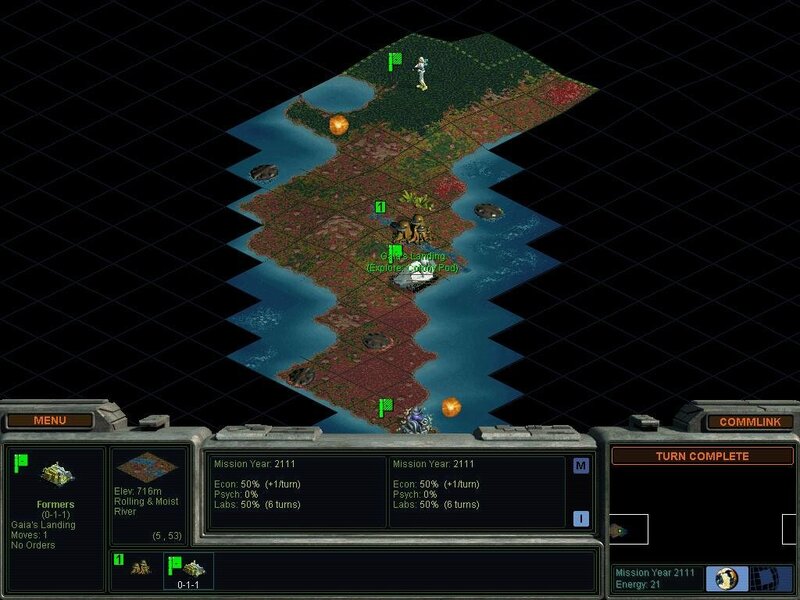 The turn-based nature of the game makes it a less-than-ideal multiplayer experience, since you’ll spend a certain amount of time just waiting for the other person to complete his turn. 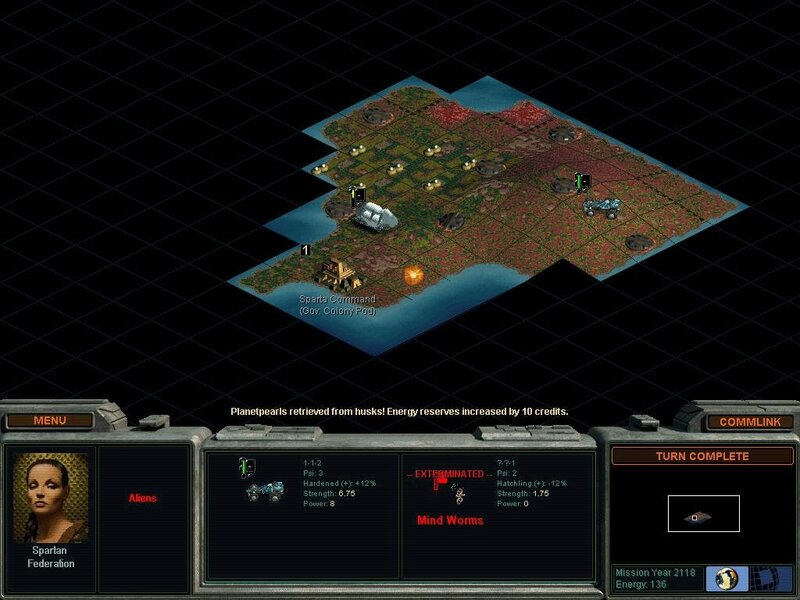 With refined and pretty much bug-free gameplay, Meier and Reynolds have shown again that they are the masters of turn-based strategy games. 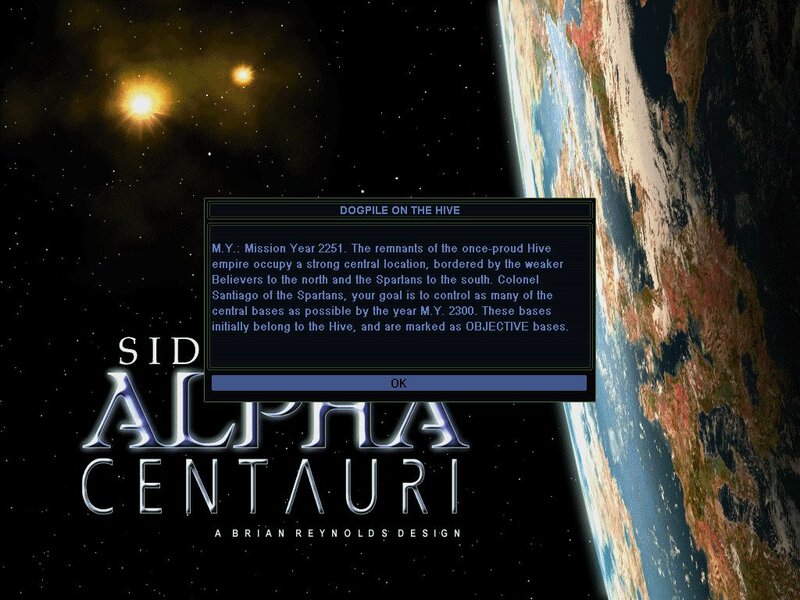 Alpha Centauri may have Civilization II at its core, but it raises the bar to an entirely new level. Hi, I’ve downloaded this game, but it won’t run I need some help please? You don’t need to install the game if you’re using win7 x64. Create a new folder on harddrive (whatever the name).